U.S. defenceman Matt Gilroy blocked Rok Ticar’s first attempt to send the puck cross-ice to Mursak, but not the second one, and the Slovenian captain beat U.S. goalie Ryan Zapolski to the stick side. It was Mursak’s second goal of the night. “I’m happy I was able to score today and help the team, but I think the whole team showed a really good performance today,” said Mursak. Slovenia surprised everyone at the 2014 Olympics by finishing seventh, and it looks like they’re planning to build on that history. This exciting upset was the first Slovenian win over the U.S. in Olympic history. The U.S. won 5-1 in Sochi in 2014. Blaz Gregorc had a goal and an assist for the Slovenes, who are making their second Olympic appearance. Brian O’Neill had a goal and an assist for the Americans, and Jordan Greenway also tallied. Zapolski, who leads the KHL with nine shutouts for Jokerit, lost his goaltending duel with Slovenian starter Gasper Kroselj. Shots favored the U.S. 36-25. The Kwandong Hockey Centre crowd of 3,348 oohed and ahhed frequently during its first taste of Olympic men’s hockey on Wednesday night. It’s the first time the U.S. has assembled an Olympic roster with a majority of European-based pros. This was a battle between two veteran teams with an average age of 30. In a manner of speaking, neither side was able to “stick” to its system early on. First, Slovenian defenceman Luka Vidmar was penalized for playing with a broken stick, and then U.S. defenceman James Wisniewski was caught getting his stick up on Jan Urbas. During the ensuing 4-on-4, a pinching Sabahudin Kovacevic had a wide-open net during a scramble in front of the U.S. net, but defenceman Noah Welch slid on his knees to block a sure goal, and Kovacevic cursed his luck as he skated away. For a while, it seemed that Slovenia, which has just 136 registered male players, would struggle to keep up with the quicker, more aggressive, and deeper Americans. “The best part of the beginning of the game was we were pursuing pucks, hunting pucks, and putting the D in tough situations,” said O’Neill. The U.S. opened the scoring with 2:16 left in the first period. Hustling along the boards past Slovenian defenders, Garrett Roe centered the puck from behind the net, and it tipped off Miha Verlic’s outstretched stick to O’Neill, who roofed it. O’Neill, who got two assists in 22 games for the New Jersey Devils in 2015-16 and now plays for Jokerit, is no relation to the former NHL executive of the same name. At 12:57 of the second period, Greenway made it 2-0, as he raced to the crease and banged in a puck that deflected to him off O’Neill’s skate. at the Olympics. Greenway (Boston University), a 2017 World Junior champion, is the first African-American player to represent the U.S. at the Olympics. “It was exciting to get my first one under my belt, but it would have been much better to get a win tonight,” Greenway said. Loud-and-proud American supporters dressed in the Stars and Stripes chanted “USA!” early in the third period, but then it was the turn of the Slovenian fans in bright green. Gregorc, a two-time Olympian who plays for HC Hradec Kralove, cut the deficit to 2-1 at 5:49. The defenceman stepped in off the right point to whiz a wrister through traffic past Zapolski’s blocker. Slovenia came close to equalizing with U.S. captain Brian Gionta in the box for tripping. Verlic, parked on the doorstep, banged a rebound through Zapolski’s pads just wide of the post. 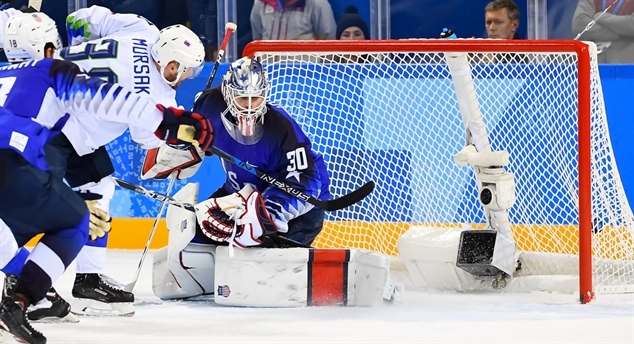 The Slovenes pulled their goalie for the extra attacker with a late faceoff in the U.S. end, and it paid off. With just 1:37 left, Mursak pivoted to whack the rebound from Gregorc’s point shot past Zapolski and tie the game. History suggests the Slovenes have plenty of reason for optimism in Korea. After Slovenia defeated Austria 4-0 in its qualification playoff game in Sochi, superstar centre Anze Kopitar was asked to explain how his country could do so well with such a small pool of players. “We’ve got 25 really good ones,” replied Kopitar. The Los Angeles Kings veteran, who led the playoffs in scoring during his 2012 and 2014 Stanley Cup runs, isn’t here – but he wasn’t even Slovenia’s scoring leader in 2014. That was forward Ziga Jeglic (4 points), who’s back for 2018. Kopitar was one of four players tied for second (3 points). “Of course we can celebrate a little bit but we have a lot of games ahead of us,” Gregorc cautioned. Slovenia’s next game is Friday against the Olympic Athletes from Russia. The U.S. takes on Slovakia that day. The U.S. last won gold in the 1980 “Miracle in Ice” in Lake Placid. However, it struggled in the four “non-NHL” Olympics after that, placing seventh in 1984 and 1988, fourth in 1992, and eighth in 1994. The Americans hope they can diverge from that pattern as they strive to honor the memory of longtime USA Hockey executive and two-time Olympian Jim Johannson, who passed away unexpectedly on 21 January. It was the first game for both teams in Group B action on the men’s side of the Olympic tournament. The Athletes jumped out to a quick 2-0 lead and looked poised to blow their opponents away, but Slovakia proved resilient and, in the end, skated to an impressive victory under new coach Craig Ramsay. The extra-man goal came on the second quick power play in the third for Slovakia because of OAR players shooting the puck out of play in their own end, plays that cost them the game as it turned out. 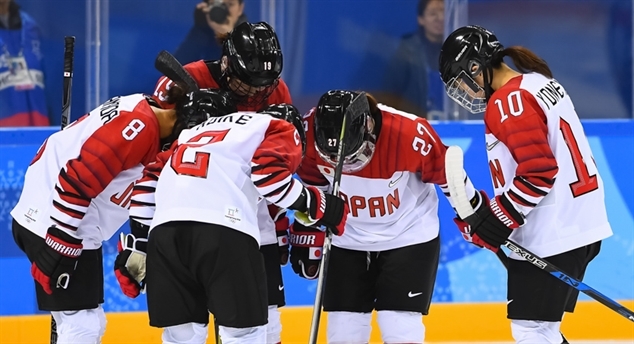 Although all teams advance to the next round of play, the loss could hurt the Olympic Athletes’ hopes of earning a bye directly to the quarter-finals. The game could not have started out better for OAR or worse for Slovakia. The Slovaks had trouble merely getting a touch of the puck let alone a rush up ice with it, and to no one’s surprise this led to an early goal for OAR. Vladislav Gavrikov drifted a quick shot from the point that floated all the way in at 2:54. Just 74 seconds later the Olympic Athletes made it 2-0 on a similar play. This time, though, Nikita Gusev’s routine shot was deftly deflected by Kirill Kaprizov in front, and the puck bounced past Branislav Konrad for a 2-0 lead. The OAR players continued to dominate, skating freely and making clever passes emblematic of the confidence they exude when things are going well. A route seemed clearly in the process of happening. But for whatever reason the hockey gods decided otherwise. Peter Olvecky skated down the right wing without looking dangerous at all. He took a simple snap shot on goal, but Vasili Koshechkin went down early and flubbed it, allowing it to go between his pads at 16:05. Just like that the Slovaks had life, and 1:50 later they had tied the score. The play started with a blocked shot by Marek Hovorka inside his blue line. Martin Bakos scooped up the loose puck and also went down the right wing, but instead of shooting five hole he snapped a shot over Koshechkin’s glove as the goalie went down. 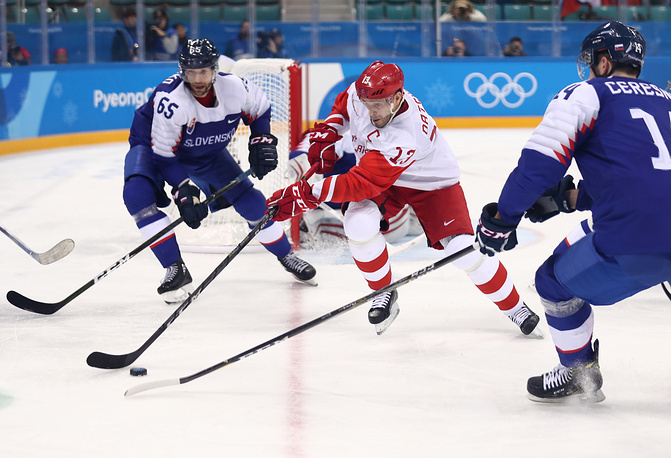 A period dominated by the Athletes form Russia was now 2-2. The second continued the reversal of fortunes. Although the OAR started the period on a power play, the Slovaks slowly but steadily skated with more confidence, moved the puck more effectively, and created several fine chances. In truth, although there was no scoring in the middle 20, it was the Athletes form Russia who were lucky not to be trailing. In the third, Slovakia was the more determined team, even after they gained the lead and incurred two late penalties. The penalty killing was superb, and the players’ willingness to block shots was brve in the extreme. In the end, it was clear they wanted to win more. Both teams have a day off before returning to the ice. Slovakia will play the United States in the early game on Friday, after which the Olympic Athletes play Slovenia. A 4-1 victory for Japan over Korea made little difference to the outcome of Group B – but it meant a huge amount to both competing nations. But Griffin was not ready to turned into a hero. “I’m definitely not a hero,” she smiled after the game. “It was a crappy shot that took a couple of bounces and went into the net. For Korea, though, there was a sense of pride despite the defeat. The home crowd was in no mood to let its heroes go, staying on after the hooter to cheer Sarah Murray’s team off the ice amid a shower of plush toys. The unified team may have been defeated on the ice, but it clearly won its place in the hearts of the sporting public of PyeongChang. Both nations now go to the classification round, where they will be joined by the beaten quarter-finalists in a play-out to determine places 5-8 in this year’s tournament. Schelling, the 2014 Olympic MVP, surpassed Canada’s Kim St-Pierre as the all-time wins leader with the ninth of her career. 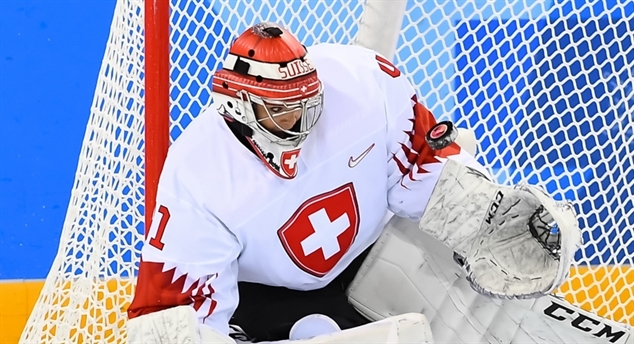 The Swiss have won three straight games in Korea. Alina Muller scored her Olympic-leading sixth goal and added an assist to help ensure Switzerland will face the fourth-place Group A team in Saturday’s quarter-finals – either Finland or the Olympic Athletes from Russia. After suffering its first loss, Sweden will battle the winner of the Finland-OAR game in the other quarter-final. Muller, 19, is now three goals away from the single-Olympics goal record of nine set in 2010 by Canada’s Meghan Agosta and Switzerland’s Stephanie Marty. Phoebe Staenz got the third-period winner, plus an assist, while blueliner Christine Meier had two helpers. For Sweden, Anna Borgqvist had the lone goal. It was the first time Switzerland and Sweden have faced each other in Olympic competition since the dramatic 4-3 Swiss victory on 20 February, 2014 in Sochi. That gave Switzerland its first Olympic hockey medal since the Swiss men got bronze in 1928 and 1948. In front of 3,545 spectators at the Kwandong Hockey Centre, Switzerland outshot Sweden 47-34. It was a physical, penalty-filled affair in which every goal came on the power play. During a scoreless first period, both Schelling and Swedish starter Sara Grahn looked sharp. Schelling had to be alert to foil Sabina Kuller’s shot off the rush and close-in rebound attempt. After Muller slipped past fellow teen and Swedish defender Maja Nylen Persson, Grahn made a great glove save. Staenz was shaken up after taking a Muller slapper off the inside of her knee during Switzerland’s first power play, but kept going. In the second period, the Swiss dialed up the pressure, hemming Sweden in for long stretches. Staenz kept battling, putting the puck off the post on a shorthanded rush and drawing a minor on the same sequence after Lisa Johansson upended her. On the ensuing power play, Muller finally broke the deadlock at 13:51 with a devastating one-timer from the bottom of the faceoff circle, set up slyly by Meier. In the final minute of the second period, Grahn kept Sweden in it when she stoned Lara Stalder on a shorthanded breakaway. The Swiss continued to sacrifice their bodies in the third period. On the penalty kill, Stalder was shaken up along the boards in a heavy collision with Swedish forward Hanna Olsson’s posterior. The pain increased moments later when Borgqvist went to the front of the net to tip Olsson’s feed high past the Swiss goalie at 7:45. But the Swiss struck back less than four minutes later. They took a 2-1 lead on the power play when Meier skimmed a perfect pass to Staenz on the doorstep and she tipped it into the open side. And that was all it took. Sweden pulled Grahn for the extra attacker with just over a minute left, but to no avail.